Peacefully at Gateway Haven, Wiarton on Monday, February 3, 2014. 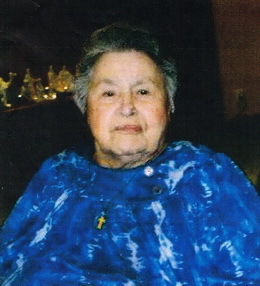 The former Isabella Chegahno at the age of 93 years. Devoted mother of Verlyn Akiwenzie-Jones (late Richard Jones 2013). Proud grandmother of David Moyer, of Owen Sound; Peter Thiede (wife Vanessa Keeshig), of Cape Croker; Sheila (Ed Janes), and Angela (Kevin Lewis), both of Cambridge; and great-grandmother of 10. Predeceased by her parents Art Burkholder and Margaret Ashkewe; husband Edwin Akiwenzie (2000); daughter Edwina Moyer (and the late Dan); sisters Pearline Elliott, Lorna McCullough and Vera Lavallee. Family invite you to gather with them at the Maadookii Seniors Centre, Neyaashiinigmiing on Wed. from 2-4 and 7-9 PM and Thurs. from 2-4 and 7-9 PM. Thence to St. Mary’s Catholic Church, Neyaashiinigmiing for the Funeral Mass on Friday, February 7, 2014 at 2 o’clock. Interment in Little Port Elgin Cemetery. Donations to the Wiarton Hospital would be appreciated. Arrangements entrusted to the Thomas C. Whitcroft Funeral Home & Chapel, 814 Bruce Rd. 8, Sauble Beach (519) 422-0041.